There are millions of people around the world who enjoy all of the convenience and benefits of self storage units. Whether it’s for keeping the holiday decorations that they don’t want lying around the house all year, or for storing spring and summer vehicles that spend the winter in a climate controlled space, self storage can be a huge weight off your mind. That being said, there are some definite do’s and don’ts to keep in mind when trying to get the most out of a self storage unit. Certain items, especially electronics, and things with sensitive mechanical parts, often require protection from temperature extremes. This means too hot, and too cold. Make sure you are aware of any such requirements before putting anything into self storage and check to see if the self storage facility you are opting to go with has units with that option available. Creating a path means making sure that there is space in which to navigate when the time comes to eventually take things out of storage. Too many people simply stuff all of their boxes and other items into their storage unit and stand back when their done looking at an impenetrable wall. You need to map out pathways in the unit that you can use to reach things. While most self storage facilities take security very seriously, there is always a chance for burglary. The best way to make sure that thieves don’t have an easy time stealing from you and to minimize your damages is to stash your valuable goods near the back of the unit, making them the most difficult to see and reach. Electronics are probably the most sensitive items that people keep in their self storage unit. They need to be kept well off the floor to prevent water damage, so putting your electronics on palettes is extremely important. This is especially true for large stereo and other sound equipment that can’t be safely stacked on top of other items. Storing food is a great way to encourage an insect infestation. This is especially true of foods that are high in sugar, salt or carbohydrates, substances that most animals will be drawn to because of its natural absence in the wild. Not keeping food in the unit is a good rule to live by. For first time storage unit users, knowing how to get the most of your new rental is important. People who have been storing their belongings in a self storage unit for years, or have had several different units over the years know that there is an art to maximizing them. 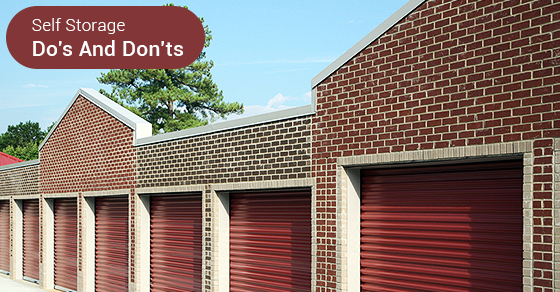 Keep the above do’s and don’ts in mind and make sure that you are getting all of the benefits and avoiding all of the potential downsides of leasing a self storage space.